"Then I saw a new heaven and a new earth. . . . And I saw the holy city, new Jerusalem. . . . And I heard a loud voice from the throne saying, Behold, the dwelling place of God is with man." (Revelation 21:1-3, ESV). In this comprehensive study, a New Studies in Biblical Theology volume, G. K. Beale argues that the Old Testament tabernacle and temples were symbolically designed to point to the end-time reality that God's presence, formerly limited to the Holy of Holies, would be extended throughout the cosmos. Hence, John's vision in Revelation 21 is best understood as picturing the new heavens and earth as the eschatological temple. Beale's stimulating exposition traces the theme of the tabernacle and temple across the Bible's story-line, illuminating many texts and closely-related themes along the way. 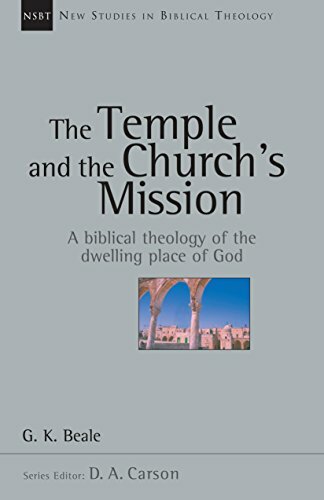 He shows how the significance and symbolism of the temple can be better understood in the context of ancient Near Eastern assumptions, and offers new insights into the meaning of the temple in both Old and New Testaments.